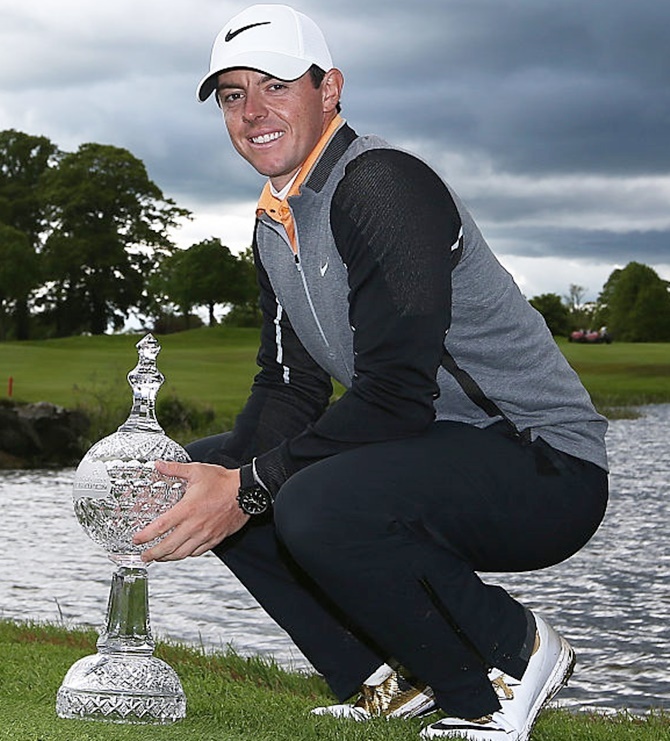 IMAGE: Rory McIlroy of Northern Ireland poses with the Duty Free Irish Open trophy. Photograph: Jan Kruger/Getty Images. Rory McIlroy shot a closing 69 to win the Irish Open for the first time after a thrilling final-round duel with Russell Knox at the K Club on the outskirts of Dublin on Sunday. The World No 3 from Northern Ireland finished three shots ahead of Scotland's Knox and Welshman Bradley Dredge. McIlroy struck a superb three-wood into the 16th green to set up an eagle opportunity and although he missed the long putt, he made birdie and Knox's bogey left McIlroy a shot ahead. The 27-year-old four-times major champion played another majestic shot on to the 18th green and this time he converted the eagle chance to secure the title in style. England's Matthew Southgate finished fourth on eight under par and German Martin Kaymer shot a brilliant round of 65 to finish in a tie for fifth on six under. US Masters champion Danny Willett, who led after the first round, struggled to a closing 77 to drop well down the field.